Not only that, but the Welsh were loath to share the secrets of smelting technology. 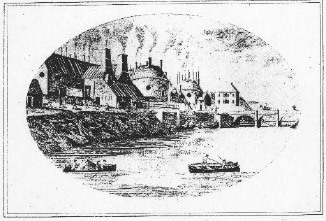 The first successful smelting operation in Cornwall was set up in 1755, the Cornish Copper Company, near Camborne, but depended on knowledge gained through family connections with the smelting industry in South Wales. Production at the Hayle Copperhouse remained small, but it also developed a sideline in the supply of timber, coal and iron to the mines, a thriving business that survived long after the smelters had closed soon after 1800. Competition from the “Great Discovery” at Parys Mountain in Anglesey eventually forced the Cornish miners, the Welsh smelters and the Midland manufacturers to join forces in 1875 with the establishment of the Cornish Metal Company. Although a failure, other joint companies were set up from 1790 onwards, starting a trend to buy up the Welsh smelting companies. The Cornish began to buy into the Welsh smelting industry. In 1803, Pascoe Grenfell, a Cornish adventurer, went into partnership with Owen Williams, son of Thomas Williams, the Anglesey mine owner, in founding the Copper Bank Smelting Works at Swansea. By 1809 Richard Hussey and John Henry Vivian, son of John Vivian, had opened the larger Hafod Copper Works at Swansea. These works became the pre-eminent smelting works of the area with the Vivian family members, namely John Henry Vivian and H Hussey Vivian, considered the leading men of their day. In 1831, the Williams of Scorrier, together with Joseph Foster, bought up the works of the Birmingham Mining and Copper Company at Swansea. Henceforward the works of Williams Foster & Co played a leading role, closely followed by Vivian & Sons. By the 1850s, the Swansea district was smelting 90% of Britain’s production. The scene was now dominated by Vivians and Williams Foster, closely followed by Grenfell & Sons and by Sims, Willyams & Co. In other words, Cornish interests now owned the majority of the smelting capacity of South Wales, a complete reversal of the situation when the Cornish Metal Company was wound up in 1791. Some of the smelters at Cadia were related to these families. After 1850, Chilean smelting works began to take business from Swansea and by the 1880s the vast American mines in Michigan, Montana and Arizona were in full production, again reducing the role of South Wales. The smelting industry in South Wales was extinguished by 1914. The Forest Copper Works, near Swansea (George Grant-Francis. On the Smelting of Copper in South Wales. Pritchett & Taylor, Printers, London. 1881: 149f).